Hunting is interesting and it is usually difficult to keep track of time. That’s just how fun it could be. Hunting brings in a momentum drive that makes you go all out in a bid to get that trophy prize animal you wish to take home. It is, of course, an exotic experience where which all your attention would be sold out to waiting patiently to catch the next prey without keeping track of the sun dripping below the horizon… and soon, darkness! The night is just around! Hunting watches, therefore, are the best hunting companion to help you keep track of time. How to choose the best watches for hunting and fishing? This watch is no doubt one of the best watch on this list. It just looks so beautiful even right from the box. It is a multifunctional watch and would be a great companion for outdoor activities especially when hunting in the wild. It comes in different colors so that you can choose the one that best fits your style and it also comes with a lot of interesting features which makes it worth a great deal for its value. It is also perfectly built to be adapted for other outdoor activities and can definitely be worn even after been done hunting in the wild. The Lad Weather German sensor sports watch is equipped with a weather prediction feature which works based on variations in atmospheric pressure and gives a high precision forecast of what to expect in the coming weather, whether sunny, cloudy, rainy or clear. It is also equipped with a functional thermometer which gives the reading in degree of the surrounding temperature at a high precision rate. One of the most striking futures of this watch is its multifunctional feature. It really has a whole lot embedded in it. In addition to being equipped with weather prediction feature, it is also equipped with features including barometer, a digital compass, thermometer measuring temperature both in Fahrenheit and Celsius, an altimeter which does not only show your statutory height above the sea level but also measures your heights across the distances you are walking in the linear graph. The watch can store up temperature and altitude data measured for up to 34 hours. The Lad Weather German Sensor Sport Watch was built to uniquely provide you with virtually all that you may need while hunting in the wild. It has the dimension of 5.8 x 5.3 x 4.7 inches and weighs 2.08 ounces. It is round shaped and its band material is made of polyurethane, a digital type display, a bandwidth of 22 millimeters and it claims to be unisex. It has a case diameter of 45 millimeters and a case thickness of 12. Its high functionality feature would help you in various situations when hunting in the wild. It also features multiple daily alarm which can work independently, day and time calendar, a dual time mode, power saving mode, EL backlight, a chronograph, and can be switched between 12 hours and 24 hours time display formats. Superb! The Casio Men’s Pathfinder Watch is a unique watch which offers many interesting features and is highly valued by people especially hunters around the globe. If you are looking for a good watch for your hunting purposes which combines so many features and goes for a relatively fair price, the Casio Men’s Pathfinder Watch is a watch you can consider. This is a very rare feature among many watches out there. One of the unique features you can enjoy from this watch is its multiple alarm system which enables you to set a maximum of 5 alarms for different times of the day r night. The alarm is characterized by a high pitch and clear tone which allows it to be heard distinctly even over a long distance range. One other interesting features you get to enjoy from the Casio Men’s Pathfinder Triple Sensor Multi-Function Sport Watch is the world time display. It has 48 cities and 31 time zones added to its database and this would therefore allow you to know the time setting in different regions of the world. This would be an additional fit for you if especially you travel frequently. The Casio Men’s Pathfinder Triple Sensor Multi-Function Sport is enclosed in a stainless steel case with a mineral dial window. This is the feature responsible for the strength of the watch and which also makes it to be able to withstand wear and tear because its use may involve sweaty wrists and climate change. 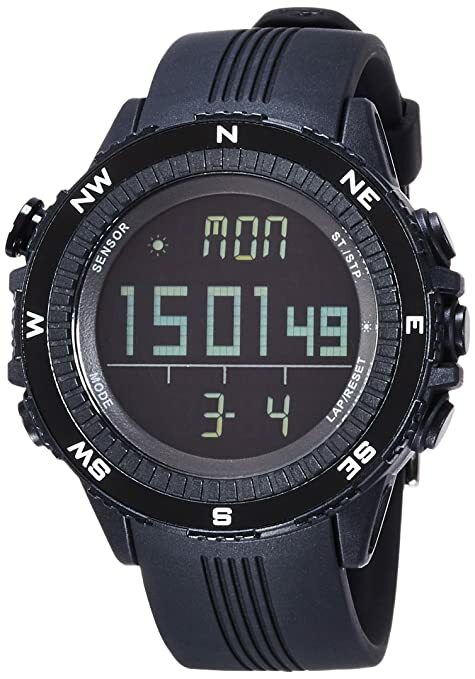 The Casio Men’s Pathfinder Triple Sensor Multi-Function Sport Watch claims that the features of this watch exactly have it has been specified. It has a very clear visual display, a quartz movement with digital display, and bright lights. It is black and solar-powered with multiple features such as altimeter, barometer, digital compass, thermometer, low-temperature resistance (-10 C/14 F), EL backlight, world time), city code display, five daily alarms, 1/100-second stopwatch, full auto calendar (pre-programmed until 2099), countdown timer, 12/24-hour formats, battery power indicator, and power-saving function. It is definitely obvious that this watch has a lot of interesting features packed into it for the benefit of the user. It has a resin band with buckle closure which has a dimension of 57.3 x 50.9 x 15.3mm. It has an estimated battery life of 6 months if fully charged without exposing it to light. 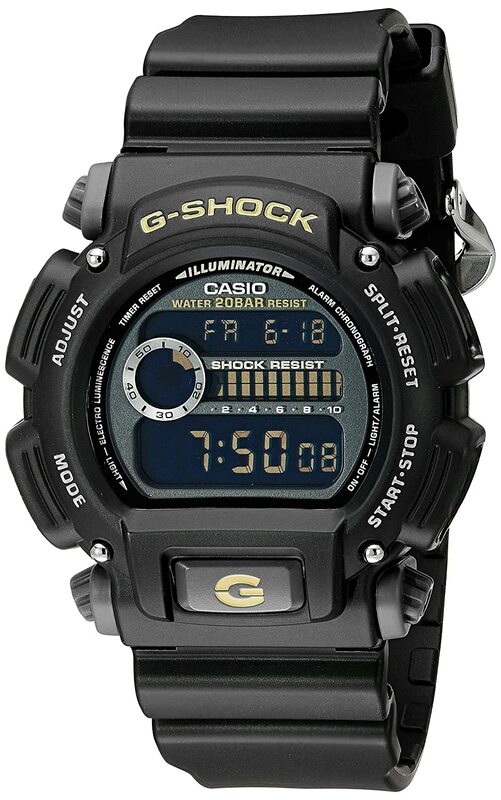 The Casio Sport watch is just another well-known G-Shock which has a lot of basic features embedded in it. Perhaps, you are looking for a watch that can last for a very long time under poor use and can withstand bad treatments or harsh conditions, and yet have a relatively light design for everyday use, this watch is just the one to look out for. With a lot of G-shock features embedded in the Casio Sport Watch, you would probably expect its price to be exorbitant but it is rather not. It is relatively cheap. The watch is not complex and it is therefore easy to operate. It has a basic design with both its bezel and strap material made up of a resin strap which closes using one pin and multiple tightening levels. The case of the Casio Sport Watch is made of stainless steel back designed with four buttons on the sides which are meant to control and navigate through the features inside the watch. One interesting features of this watch which is as well common to most G-shock watches is that it is lightweight. Carrying it on your wrist all day long and even while going through your hunting expedition in the wild would definitely not leave a strain on your wrist at the end of the day. 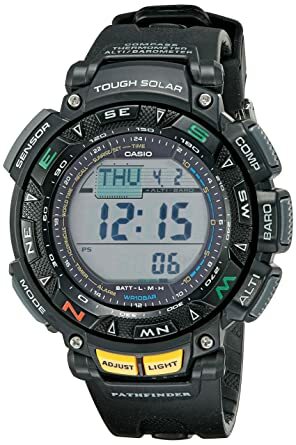 The Casio Sport watch has been used predominantly by soldiers especially in Iraq and Afghanistan due to the fact that the watch is lightweight and offers several functionalities at the same time. The Casio Sport Watch has the dimension 1.9 x 1.7 x 0.6 inches and it weighs with its case diameter being 48.5 millimeters and its case thickness being 43 millimeters. It is shock resistant and features a multi-function rectangular dial with afterglow EL backlight. This would be a big thing for a lot of people and would definitely be a huge plus especially when hunting at a spot where it is little or no reflection due to thick vegetation cover. It also features daily alarm and a countdown timer. It also features a 1/100-second stopwatch, hourly time signal, auto calendar and 12/24 hour formats. The watch is water resistant to 200 m (660 ft) and it is also a good fit for marine activities. The Suunto Core watcher is a one of a kind watch which has a simple design and would work as a perfect companion even as you get the best from it in the wild when hunting. It has a superb design which makes it very sleek and fits perfectly well on the wrist. As simple and unique as it design is, it is loaded with vary awesome features which makes it a top pick for most buyers. 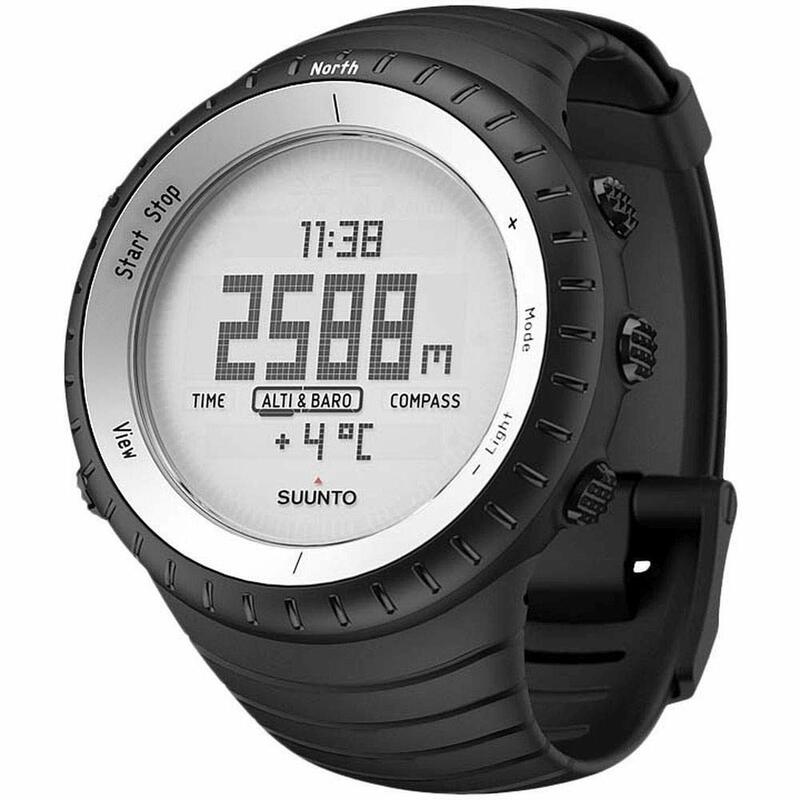 The Suunto Core displays elevation in three-foot intervals while many other watches out there show elevation in ten-foot intervals. The altimeter/barometer function on the watch has been proven to be the best after several testing and operating by customers. The Suunto Core watch gives an accurate reading by calculating your activities and long-term trends. The ABC here refer to the Altimeter, Barometer and the Compass. With Suunto Core watch, you can rest assured you have got the best gear for taking these measurements even as far as possible in the wild. It offers a high precision reading. Its working capability is a strong and reliable to the extent that even if you are far into the ravines and the wild, it can still give you a substantially precise reading even without direct line of sight to the GPS satellites. The Suunto Core watch features a weather trend indicator which uses recorded data from the barometer over the past 3-6 hours and analyses this data to give a highly precise prediction of how the weather is going to be in subsequent times. 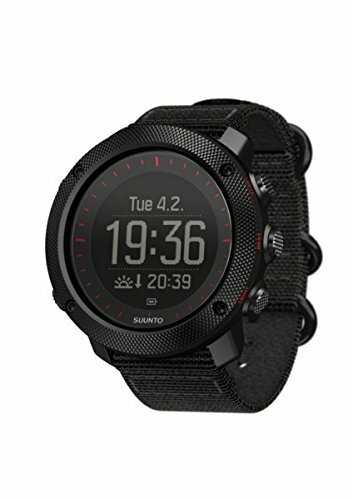 The Suunto Core Watch is a great gear for outdoor activities especially hunting and its built-in features are a great plus in helping the user get the best experience at any time of use. It has a measurement of 49.1 x 49.1 x 14.5 mm / 1.93 x 1.93 x 0.57 inches and weighs 79 g / 2.79 oz. The bezel is made of Steel material, the Glass is made up of Mineral crystal, the case is made of composite material and the strap is made up of an elastomer. It features a Storm Alarm, depth meter for snorkeling, multiple watch, date and time functions. When you are looking out to get a watch which has good inbuilt technology without necessarily being complex to operate, you should consider the Garmin Fenix 2 GPS watch. Of course, complexity in operating is something you should avoid in any watch you are going to buy as you may not have the luxury of time to carefully operate your watch when waiting to shoot a prey. Therefore, the Garmin Fenix 2 GPS offers a blend of interesting features and simplicity. For many hunting lovers looking to get a watch, of course, one of the questions they would ask is what the battery life of this watch looks like. The Garmin Fenix 2 GPS has a battery life of up to 50 hours in GPS mode and has up to 5 weeks in watch mode. This is an interesting feature which keeps the watch up and running for a relatively long period of time. It has been established that the Garmin Fenix 2 GPS watch has been built to be very sensitive to GPS positioning and as such can connect with the GPS within a short instance of time. You don’t have to worry about how easy it’s going to be receiving with the GPS signal as the watch provides you with comprehensive navigation and tracking functionalities which would guide you while you are in the wild. The Garmin Fenix 2 GPS watch is one of the best watch you can choose when you are putting durability and sturdiness in view. The watch merges a strong covering to resist shocks with a curved mineral glass lens to withstand. It also boasts of a large LCD display with a red LED backlight and a topnotch polyurethane wristband. 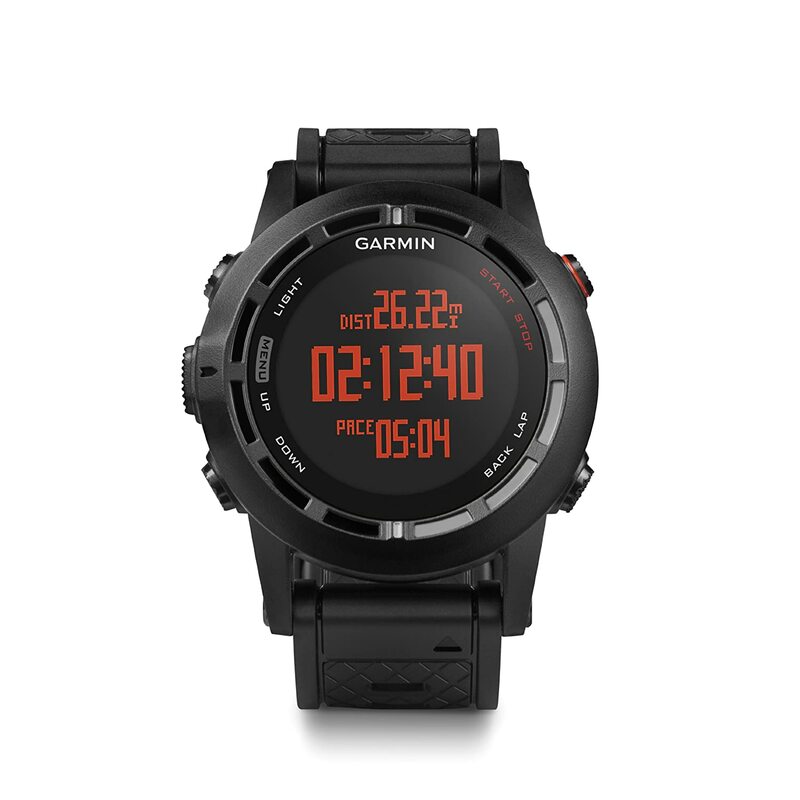 The Garmin Fenix 2 GPS watch has the dimension 0.7 x 1.9 x 1.9 inches and weighs 3.04 ounces. It has quite a number of sport-related features such as advanced fitness metrics, advanced running dynamics and swim profile and Ski-Board mode. This means that beyond using the watch for hunting purposes, it can be well adapted for your sporting activities. This watch would definitely be a perfect fit for both hunting and sport lovers. This GPS hunting watch is a choice watch made in Finland and takes durability to a whole new level with its water-repellant nylon strap, stainless steel bezel and a premium scratch resistant sapphire crystal glass. The Traverse Alpha hunting and fishing watch is a piece of flawless equipment that offers a load of options for hunters and have been tested against Military standards. It offers a lot of interesting features and has a fascinating design. The Suunto Traverse Alpha features an automatic shot detection system which keeps track of when and where you shoot and gives a clear coordinate of your location through GPS for viewing after the hunting procedure. The Suunto Traverse Alpha offers a red backlight in addition to the daytime backlight. This was added to its features so as to make it usable for nighttime purposes. This watch features a lightweight slim silicon watch band which can be adjusted to fit just right to the wrist of your arm. Its band makes it fit perfectly undergarments too and you can wear it for another purpose other than hunting too. The watch is made up of a built-in flashlight. With this watch, you can also get to receive mobile notifications and see incoming calls as it has a Bluetooth smart connection built into it. It has Movescount App which helps to in route forecasting and its FusedAlti app enables you to track the altitude as to your vertical speed of the extent of your ascent. It also features a location-based moon phase calendar with moon rise and moon set which helps in deciding on the best time of the day to consider for your hunting trips. Additionally, it features a barometric pressure graph and storm alarms with which you can monitor and keep track of weather changes. This gives you a prompting of when to go for hunting and how the weather would turn out to be in time whenever you are on your hunting expedition. The strap material of this watch is made of nylon textile, the lens is made of sapphire crystal and also has a rechargeable Li-Ion battery. The Timex Men’s Expedition watch seeks to undercut more expensive and popular competitors and it therefore cheap and offers a lot for its price value. It successfully unites several features which buyers look for in watches together into a very competitive price and as such, one of the watches which is on fast sales. It is a good watch to purchase for hunting purposes because of the interesting features that come with it. If you are looking for a watch suitable for hunting and adventures at a very cheap and affordable price, this would be a good fit.Apart from the fact that it is cheap and affordable, it offers comfort, superior quality, and high-end features which you may not even get in some costly watches. The Timex Men’s Expedition watch is one tough watch which was built to quality and with topnotch materials. It was designed for outdoor torture test and features a shock resistance which has passed ISO standards. In addition to this, it is waterproof so you don’t have to worry if perhaps you were caught in the storm while you are in the wild or if you had like to use it for swimming purposes. 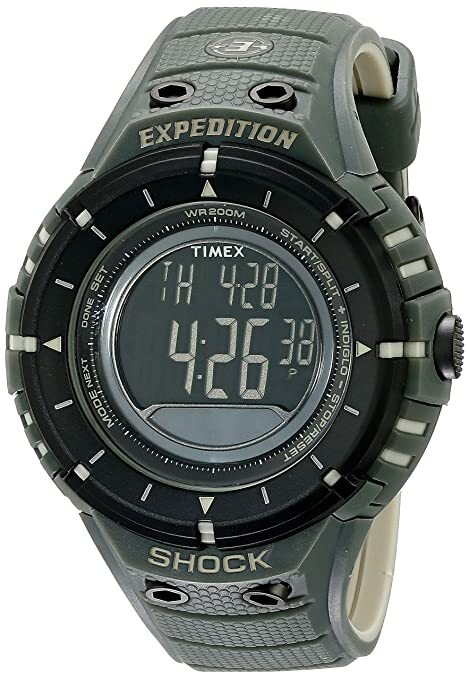 The Timex Men’s Expedition watch has the dimension 4.7 x 3.5 x 2.9 inches. The watch features multiple timers and alarms, and hydration timer. It also features an Indigo Light-Up Watch Dial with night mode features and it is water resistant down to 200m (600ft). It is made up of a durable resin case and strap with buckle closure. It also comes with a calendar function and 100-hour chronograph with 99-lap counter and split times. Built in it is also a digital compass with displays reading in degrees. In addition, the time counting accuracy of the watch is reviewed to be precise and topnotch. The Luminox Men’s 3051 EVO watch is a watch that has a long reputation of being best suited for Navy and military purposes. However, while hunting in the wild, we can as well assume you are the navy or military man and your prey is just the villain waiting to be captured; perfect! The watch is definitely appropriate for hunting purposes and the user can be rest assured of getting high benefits from this watch even at a greater worth than its value. The Luminox Men’s 3051 EVO watch claims to be an ideal watch for both light and no light situations as a result of the fact that it glows 100 times brighter than other luminous watches, which allows for easier visibility. 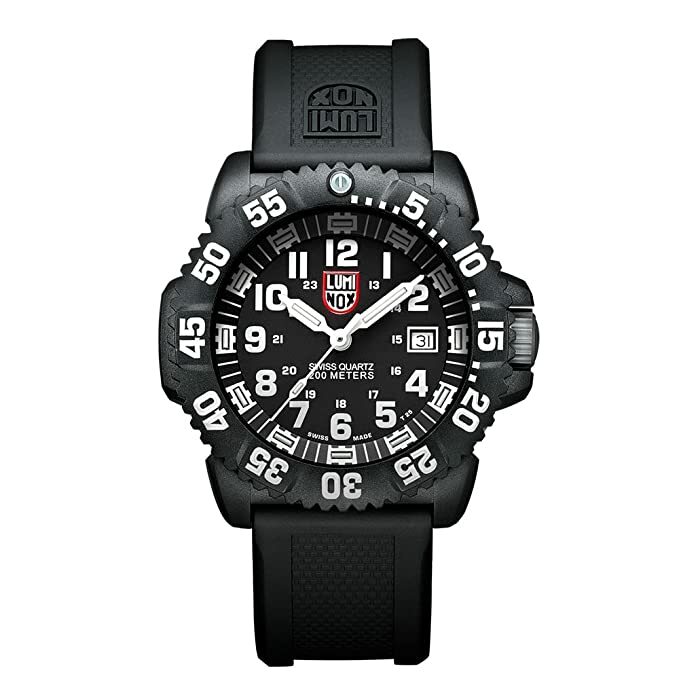 The Luminox Men’s 3051 EVO watch is one timepiece of which its durability can be vouched for. It is constructed with a 43.9-millimeter polyurethane case and matching durable polyurethane band which lends it the color, abrasion resistance and toughness. It was built for a long lasting usage and function properly for years even without maintenance. This timepiece has an eye-catching design which makes it attractive when tied to the wrist. It is designed with a white Arabic numerals contrast with the classic black dial and has smaller white numerals for the 24-hour clock. The Luminox Men’s 3051 EVO watch is an exceptional watch with interesting but limited features. Its dimension is 6.5 x 3 x 2 inches and weighs 12.8 ounces. It features a simple design, a date function which rests at the three o’clock position of the watch. It has a unidirectional textured bezel feature popping-white minute indexes for easy readability. It is designed with an analog display type and is made up of a polyurethane band material. It has a Swiss quartz movement and has a unidirectional benzel function. Before opting in for any kind of hunting and fishing watch to keep track of time while getting the best from your hunting experience, it is important to not just go to the market for the sake of getting one but you must go armed with the following knowledge of what to look out for. You don’t want to buy a watch today and have to change it for one reason or the other any time soon, but knowing the following would definitely get you covered. This is about the most important thing to take note of when setting out to buy a night watch. The Compass and GPS it’s something you should always look for as having the watch feature a compass would provide an additional option in case you lose your personal compass. Obviously, the GPS is an awesome feature to as it gives you the possibility of real-time tracking in case you get lost in the forest while hunting or coming back home. However, it is highly advisable to also have a much larger GPS to serve as a backup as that of the watch may be small and at times difficult to read. One of the questions that you need to answer and need to get covered is: how long would your battery stay on in the forest? Dare to get this covered as you don’t want to be stranded having anything to monitor the passage of time in the jungle. Of course, you would need your GPS, Compass, and a couple of other things running while out there and it is therefore important to know that these features consume battery power with time. It is, therefore, the best to go for a watch that has a high battery rating while buying your hunting watch. This is one of the things on this list that must not be compromised. It is important to get a watch that is very reliable and durable. In fact, this point could be taken as the basic thing to without for as all other features virtually rest on this durability. Most times, good watches are usually a mix of stainless steel and materials of the similar likeness that can withstand bending and beating. This may weigh little or nothing to some but the hard truth is that no matter how beautiful the hunting watch may look, there would be a bit of an issue if its display system and design make it difficult to read the time at a straight glance. When choosing a hunting watch, the display type should be given to consideration. Why? Because you need a lot of your attention to be focused on looking out and aiming for any prey. You should, therefore, be advised that getting a hunting watch that offers digital display would be the best. Surprisingly, this feature is often overlooked by a lot of hunting watch buyers but which as a matter of fact, you need to take note of this to ensure durability and your comfortability anytime you wear it. Whenever you are shopping for a hunting watch, make sure the band fits rightly with your arm and ensure to avoid oversize band so it wouldn’t be disturbed while enjoying your hunting expedition. The truth is, rain can fall anytime and it would be very bad if by any chance there is an unexpected rainfall especially when you have a watch which is not waterproof on. Therefore, you should consider buying hunting watches which are waterproof in case of a rainstorm or any possibility of contact with water. The hunting watches are relatively ideal for hunting purposes and can be well adapted for other outdoor activities too but one of the things which must be pivotal in your choice of any hunting watch is its durability, interesting features such as ABC that comes with it and affordability. It must feature a lot at an affordable price and therefore, the LAD WEATHER GERMAN SENSOR SPORT WATCH is the best among the eight watches reviewed above.